Scadding House in Trinity Square (Toronto), beside the Eaton Centre, photo March 2018. Toronto has many interesting heritage buildings, some in prominent locations and others tucked away from the public eye. The dichotomy of Scadding House is that it is in one of the most high-profile sites in the city, yet remains hidden from view. Only a narrow space separates it from the west side of the Eaton Centre, which attracts thousands of shoppers and visitors annually. There is a small historic plaque on the house’s south facade that informs those who pass by that its original resident was Dr. Henry Scadding. However, it seems that few people notice the plaque. This is a pity, as the house is one of the most historic buildings in Toronto, and one of the few pre-Confederation dwellings that remains in the city today. The story of the Scadding family is intertwined with the early-day history of York (Toronto). Henry Scadding’s father, John Scadding (1754-1824) was the manager of the 5000-acre estate of John Graves Simcoe when he lived in Devon, England. In 1792, Simcoe was appointed Lieutenant Governor of Upper Canada (Ontario), and John Scadding sailed across the ocean to join his employer. Simcoe hired Scadding as an assistant, and granted him 250 acres of crown land on the east side of the Don River. In fulfilment of his “Settlement Duties, Scadding built on the property a modest cabin and barn with square-timbered logs of white pine. Today, its location is where Queen Street East crosses over the Don Valley Parkway. In 1796, John Scadding returned with Lieutenant Governor Simcoe to Devon, England, leaving the cabin beside the Don River under the care of a neighbour. After Simcoe died in 1806, Scadding became the estate manager for his widow. The same year, he married Milicent (Melly) Triggs, and in the years ahead they had three sons. Scadding returned to Upper Canada (Ontario) in 1818, and three years later, brought his wife and sons to York (Toronto). One of the boys was Henry, born in 1813. In 1879, members of the York Pioneers dismantled Scadding’s cabin near the Don River and relocated it to a site in Exhibition Park. There, they re-erect it, using the tools and techniques of the past. The cabin remains on this location today, a testament to the city’s first act of architectural conservation. The education of Henry Scadding, the son of the pioneer who erected Scadding cabin, began the first year he was in York. At eight years of age, he studied under the tutelage of John Strachan at the Home District School. When Upper Canada College (UCC) opened on King Street in 1830, Henry was 17 years old, and was the first student to enrol in the college. In 1833, Henry travelled to England to study at Cambridge. His education was partly financed by Elizabeth Simcoe, the widow of Lieutenant Governor Simcoe. She had been his father’s former employer. Henry Scadding departed England in 1837, returning to Upper Canada. In 1838, he was appointed Master of Classics at Upper Canada College, his alma mater. The same year, he was ordained an Anglican priest in Quebec, where he taught for several years. Returning to Toronto in 1840, he served at St. James Cathedral on King Street East as the assistant minister and Strachan’s domestic chaplain. In June 1847, Strachan appointed Scadding the incumbent of the newly-constructed Church of the Holy Trinity. The church was located in Trinity Square, between Yonge and Bay Streets, north of Queen Street West. On the east side of the square there was a short street that connected the square to Yonge Street. It was also named Trinity Square. At #10 Trinity Square, in 1862, a church rectory was built for Henry. It possessed four floors and an attic, the first-floor partially below ground. It was in this rectory that he wrote, “Toronto of Old,” published in 1873. 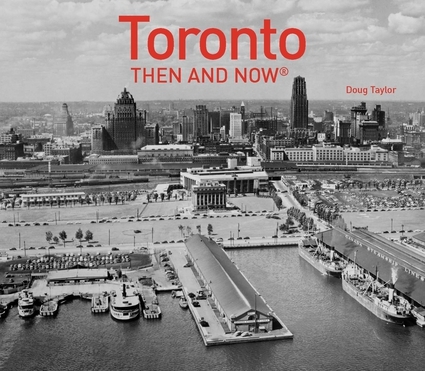 It was the first book of consequence about Toronto’s history. I personally employ this book frequently when researching sites for this `blog. As mentioned, the rectory of the Reverend Henry Scadding still exists today. Located on the west side of the Eaton Centre, it is adjacent to the Church of the Holy Trinity. It was Scadding’s home between 1862 and 1901. Its architect was a Scotsman, William Hay, who designed it in a style that was similar to many townhouses erected in Toronto during this period. The yellow-brick house was plain, with few architectural adornments. However, on the top floor, on the east side, there was a small balcony, accessed from Dr. Scadding’s study. The balcony was trimmed with ornate woodwork created by hand with a coping saw. From the balcony, Scadding possessed an excellent view of Centre Island to the south, and to the east, the Scarborough Bluffs. Today, because of the tall structures surrounding the house, the view can be measured in feet rather than miles. Patricia McHugh in her book, “Toronto Architecture – a City Guide,” refers to the style of the house as “Georgian/Gothic,” although I fail to see any hint of Gothic in its design. The hip roof contains gabled windows, the chimney for the fireplaces inside the home positioned in the centre of the roof. This is unusual, as most houses build the chimneys on opposite sides of the roof. Henry Scadding passed away in 1901 and was buried in St. James Cemetery. After his death, the house had various tenants and was empty at times. However, Mary Dixon lived on the top floor of the house from 1966 until 1974. She stated that when she lived there, the floor below her was sub-divided into apartments. The second floor contained church offices, and the ground floor was a meeting place for locals, as well as a restaurant that became a coffee house in the evenings. In 1974, great changes occurred in the history of Scadding House. A developer wanted to purchase the house and demolish it to permit the building of the Eaton Centre. Following difficult negotiations, a deal was agreed upon in which the house was to be relocated 150 feet to the west. On its new site, it would be to the immediate east of the Church of the Holy Trinity, close to the west side of the Eaton Centre. After the relocation was completed, restoration of the premises commenced and fire-escapes were erected in the narrow space that separated it from the Centre. At some unknown date during the previous decades, the balcony on the fourth floor of the house had disappeared. Likely it had been removed as it was in poor condition and in danger of falling to the street below. When the house was restored, the ornate balcony on the top floor was rebuilt. Today, the house appears much the same as it did when Dr. Henry Scadding was in residence. It is rented to various not-for-profit agencies, so is not open to the general public. This is a pity, as it is such an important part of the city’s architectural heritage. Toronto No Mean City, Eric Arthur, published by University of Toronto Press, 1964. Dr. Henry Scadding in 1860 at age 47, photo from the collection of the Toronto Public Library. Dr. Henry Scadding in 1885 at age 72, photo from the collection of the Toronto Public Library. Sketch of 1890 depicting the view gazing west on the street named Trinity Square. Scadding House is visible, with its fourth floor balcony. The street appears charming,with its mature shade trees and gas lamp, a part of the “Toronto of Old” that no longer exists. Sketch from the collection of the Toronto Public Library, r-5723. The study and library of Henry Scadding in 1900, a year before his death. It was on the fourth floor of the home, where the balcony was located. The fireplace likely burned coal. Toronto Public Library, r-5474. Henry Scadding’s desk in 1900. Photo from the Toronto Public Library, r-5475. Scadding House on its original location. The view in the photo looks east toward Yonge Street on the street named Trinity Square. On the north side of the street, Scadding House is the four-storey building on the right. Photo from the Toronto Public Library, r- 5724. House being lifted onto a frame of iron girders to relocate it in 1974. The shops on Yonge Street are visible in the background. Toronto Public Library, tspa 0109997. Scadding House in 1974 after it was relocated to the east side of the Church of the Holy Trinity. The land in the foreground is where structures were demolished to construct the foundations for the Eaton Centre. Toronto Archives, Fonds 1526, Fl0083, item 0061. Scadding House in 1974 after it had been located 150 feet to the west of its original site. The hoarding to the right of the house is where the foundations of the Eaton Centre will be excavated. The balcony on the fourth floor remains missing. Toronto Archives, Fonds 1526, Fl0083, item 0021. This dramatic photo taken in 1975 shows the house perched precariously beside the immense construction site for the foundations of the Eaton Centre. The view looks to the northeast, the signage for Dundas Square at Yonge near Dundas visible in the background. Toronto Archives, Fonds 1526, Fl0083, item 0024. View of the north facade (rear) of Scadding House in 1977, prior to its restoration. Toronto Public Library, tspa 0112942. View in 1978, after the fourth-floor balcony had been restored. The Church of the Holy Trinity is on the west (left) side of the house and the Eaton Centre is on the east (right) side of it. Toronto Archives, Fonds 1526, fl0024, item 0030. View of Scadding House in 2018 (left) and (right) the sign that appears on the west facade of the building. The balcony on the fourth floor after it was restored. A gabled window in the attic is visible on the roof. The north facade (rear) of Scadding House in 2018. The south (front) facade of the house in 2016. The space between the house and the Eaton Centre contains the fire-escapes. The church is to the west (left) of the house.